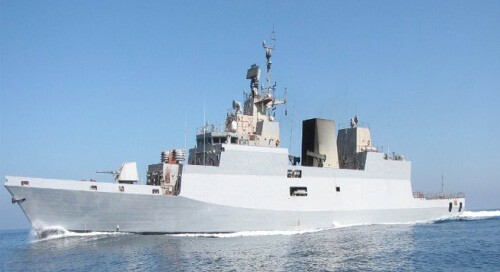 Kolkata, Oct 30 (IANS) The Garden Reach Shipbuilders and Engineers (GRSE) on Tuesday signed a Rs 2,435.15 crore contract with the Ministry of Defence for designing, constructing and supplying four survey vessels for the Indian Navy, an official release said here. The contract was signed after the GRSE emerged as the lowest and successful bidder for the survey vehicles. The Indian Navy had issued a Request for Proposal to four Defence Public Sector Undertaking shipyards -- Garden Reach Shipbuilders & Engineers Ltd, Goa Shipyard Ltd, Hindustan Shipyard Ltd and Cochin Shipyard Ltd -- in April, 2016. The first ship is to be delivered within 36 months from the date of singing the contract, and the rest of the ships within an interval of six months for each vessel. The project completion time is 54 months from the date of signing the contract. The survey vessels would be large with a length of 110m and deep displacement of 3,300 tonnes and complement of 231, capable of full-scale coastal and deep-water hydrographic survey of ports and harbours, approaches and determination of navigational channels/ routes. The vessels would be deployed for Oceanographic and Geophysical Data for Defence applications. "In their secondary role they shall be capable of performing limited search and rescue, limited ocean research and operate as hospital ships or casualty holding ships," the release said. The vessels would be equipped with highly advanced state-of-the-art hydrographic equipment and sensors including a hello hanger to accommodate one advanced light helicopter.